(except that two partial glyphs at the right edge of #1/#2 have been erased). Bonuses. 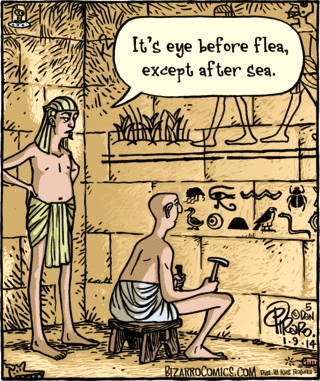 Piraro has turned to hieroglyphic writing for humor on at least two other occasions. 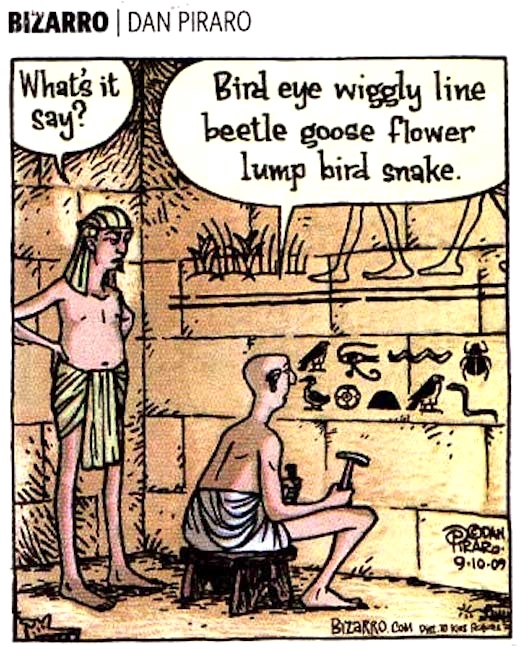 Another bash at the hieroglyph-emoji relationship. 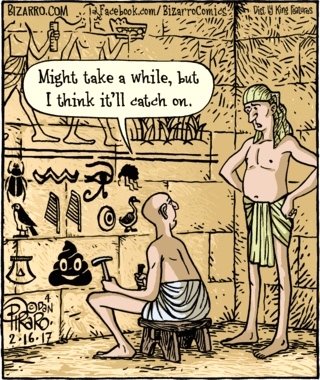 For discussion, see my 10/28/16 posting “Emoji days” (with two cartoons on the subject), where I note that emoji are primaily ideographic / pictographic, while hieroglyphs are primarily linguistic (representing specific words or phonological material). There’s a conventional format for these events. In part, as illustrated above: the contestant is given a word by the moderator, and can ask the moderator for a definition. 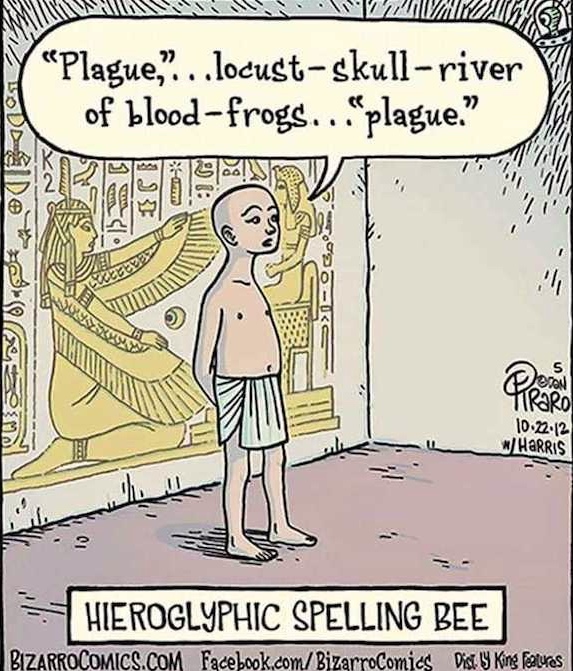 Then proceeds by pronouncing the word (signalling the beginning of the spelling), spelling it out loud (pronouncing the names of the letters in it, in order), and then pronouncing the whole word again (signalling the end of the spelling). 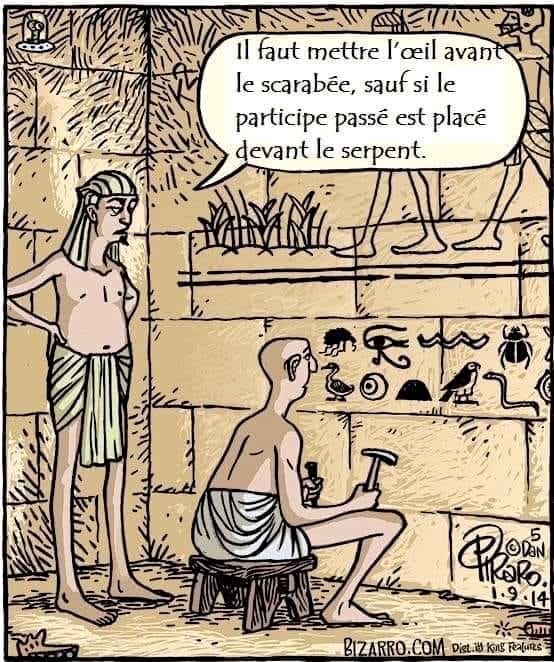 This entry was posted on March 19, 2019 at 1:53 pm and is filed under Linguistics in the comics, Spelling, Writing systems. You can follow any responses to this entry through the RSS 2.0 feed. You can leave a response, or trackback from your own site. I opted not to include this fact in my posting, which already ranged over lots of stuff (and took me 10 hours to assemble), but it is in fact crucial to a full understanding of the French version in #1, so thank you for adding it. I posted because I felt a need to show off, after figuring it out using half-remembered grammar and a lot of google.. I didn’t think I was telling you anything new. This strikes me immensely funny – as, an 80 year old retired physician, I cram a word list to defend my title – the third year running – of adult spelling bee champ at the Blount County public library (pronounced blunt) – south of Knoxville in east Tennessee. Researching this a bit, I learn that spelling bees exist only in English, with our godawful orthography. The French do somewhat similar exercises, with exact transcription of a dictated text, and the Chinese, with look-up in a Chinese dictionary. But the spelling bee is a US English phenomenon.